AGE Reader. Non-invasive assessment of cardiovascular risk. The AGE Reader is a non-invasive monitoring device that uses ultra-violet light to excite autofluorescence in human skin tissue. The autofluorescence is from the level of Advanced Glycation End products (AGEs). The measurement of AGEs provides an immediate cardiovascular risk prediction in 12 seconds. The AGE Reader has been designed for patient friendly diagnosis and because of this allows doctors to practice personalised care and prevent disease (progression). Additionally, the method is convenient, easy to use and extensively validated. The AGE Reader mu – connect is the answer to the need for measuring AGEs without the disadvantages of existing methods. It combines a high measurement quality standard, with an innovative design and at an attractive price level. 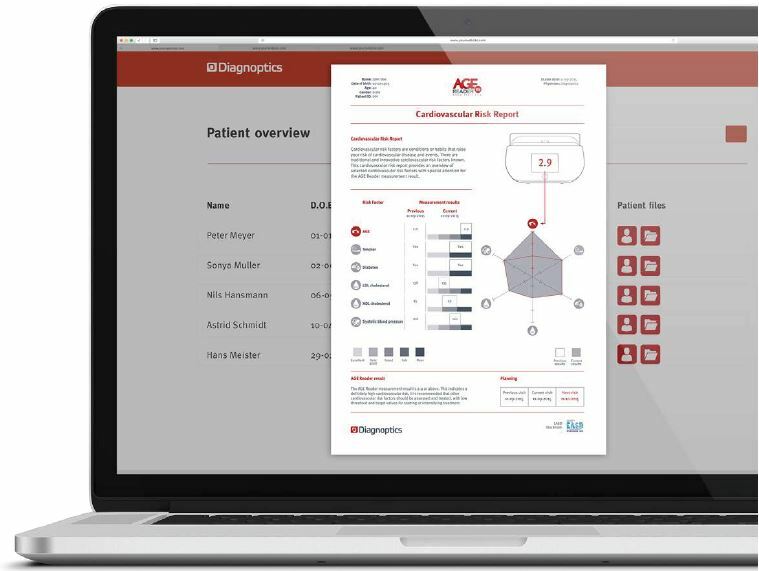 The AGE Reader provides information that can assist physicians in diagnosing and treating patients with high cardiovascular risk. This includes patients suffering from diabetes mellitus, renal failure and also acute disorders like acute coronary syndromes and sepsis. Moreover, the device is an excellent tool for researchers in various fields. Patient management: early detection of (diabetes) patients at risk of developing cardiovascular complications. Professional health assessment: identify individuals with an increased risk of diabetes and additionally the metabolic syndrome. Anti-aging and skin-care: identify people with increased levels of AGEs to improve skin care and reduce aging.